The Young Agricultural Ambassadors Program is forging ties between innovative Taiwan farmers and counterparts throughout Southeast Asia. 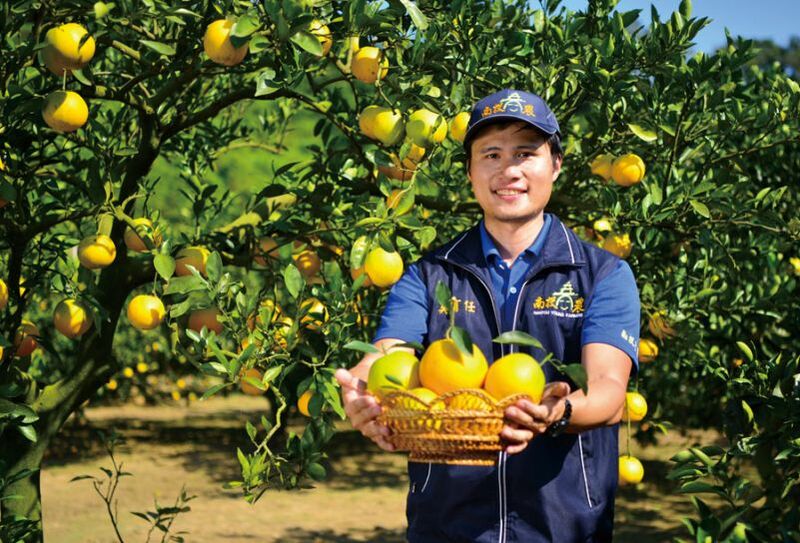 Four years ago, Eason Wu (吳育任) took over his grandfather’s fruit farm in central Taiwan’s Nantou County and set about modernizing the business. His three-pronged strategy involved introducing innovative production processes, cultivating rare varieties like navel oranges and reaching out directly to consumers through farmers’ markets and social media. The approach quickly proved successful, earning the 36-year-old inclusion on the Cabinet-level Council of Agriculture’s (COA) Top 100 Young Farmers list for 2017. “I still can’t keep up with the demand for my oranges, even though they’re priced higher than equivalent products from other suppliers,” he said. 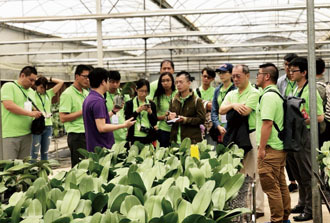 Last year, Wu signed up for the Young Agricultural Ambassadors Program (YAAP), an initiative jointly developed by the COA and the Ministry of Foreign Affairs (MOFA) to connect Taiwan’s new generation of farmers with counterparts in South and Southeast Asia. On Aug. 26, the YAAP dispatched two teams of 15 agricultural students and specialists on eight-day tours of Malaysia and Vietnam, respectively. The delegations visited academic and research institutions, farms, food processing facilities, government agencies and traditional markets. Wu, who joined the Malaysia group, described the trip as a deeply rewarding experience offering insights into local conditions and spotlighting a host of possible investment opportunities. “With our strengths in automated equipment, biotechnology and integrated crop management, I think we can really help farmers there overcome issues such as plant disease and forge a mutually beneficial cooperation model,” he said. The YAAP was launched in 2017 under the government’s New Southbound Policy (NSP). A key plank of President Tsai Ing-wen’s (蔡英文) national development strategy, the NSP is enhancing the nation’s agricultural, business, cultural, education, tourism and trade ties with the 10 ASEAN member states, six South Asian countries, Australia and New Zealand. Each year, 30 agriculturalists aged 18-40 with experience in areas such as animal husbandry, farming, fisheries and forestry are selected to take part in the YAAP. Participants are divided into two groups and tour an NSP target country. Indonesia and the Philippines were the destinations during the inaugural year of the initiative. Vincent Lin (林家榮), deputy director general of the COA’s Department of International Affairs and head of last year’s delegation to Malaysia, said the YAAP aims to expand the global outlook of Taiwan’s young farmers and foster international awareness of their dynamism and proficiency. Participants are well prepared prior to departure, attending seminars in topics ranging from an overview of the local agricultural sector to their destination country’s culture, customs and dining practices. These courses help them more effectively communicate Taiwan’s strengths and pinpoint opportunities for collaboration, Lin said. In addition to furthering the NSP, the ambassador initiative is targeted at encouraging young people to consider a career in agriculture. With the average age of Taiwan’s farmers reaching 62, the COA has rolled out a host of measures in recent years to boost interest in the profession. Besides the YAAP, these include the Top 100 Young Farmers and Young Farmer Training programs. The latter offers subsidies to new recruits in areas spanning financing, land and technical training. Eason Wu is a beneficiary of many such government programs. In addition to taking part in the YAAP, the orange, pineapple and watermelon grower has received COA funding to study for a bachelor’s degree in farm management at National Chiayi University in southern Taiwan and is on track to graduate in June. Another eager participant in the COA programs is fellow Nantou native Tsai Fu-rong (蔡富戎). His experiences mirror those of Wu. 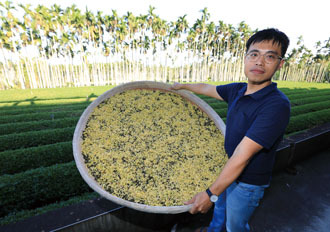 In 2013, Tsai returned home to take over a family tea farm and he is now passionate about expanding his business by partnering with overseas operations. The 32-year-old was also selected for last year’s YAAP program. He joined the delegation to Vietnam as his wife hails from the Southeast Asian country and he has picked up some of the language. “We forged connections with several agricultural agencies, research institutes and successful companies working there for decades, something that would have been very difficult to accomplish without assistance,” he said. Tsai sees abundant growth opportunities in Vietnam given the country’s emerging middle class and rapid urbanization. “Imported teas are becoming a status symbol, so there’s rising demand,” he said, adding that sales of organic products are similarly registering impressive growth. 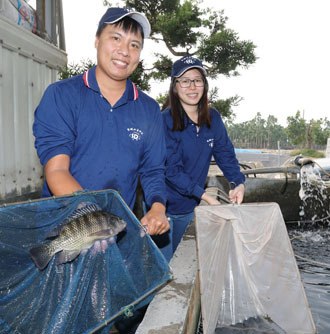 Husband-wife tilapia farmers Eason Huang (黃壹聖) and Momo Yan (顏孟加‬) share Tsai’s optimistic outlook on collaborative tie-ups with regional producers. The duo joined the YAAP delegations to the Philippines and Indonesia, respectively, in 2017. According to Yan, the program provided valuable perspectives on evolving ASEAN markets. Yan, who earned a master’s degree in computer science and information engineering, has helped modernize her husband’s family fish farm in southern Taiwan’s Pingtung County, creating a variety of standard operating procedures as well as a database for climatic conditions, productivity records and water quality readings. The couple has also designed and built various advanced aquaculture facilities, including automatic fry collection and feeding control devices, movable aerators and water circulation systems. Their farm has a 40 percent share of Taiwan’s tilapia fry market, Yan said.